There were others—too many to quote—who promised deliverance through their brands of architecture: the right angle, the curvilinear road in the park, the tower of glass. Each fervently preached that his was the magic geometry that, like tumblers on a lock, would open the way to the good life. 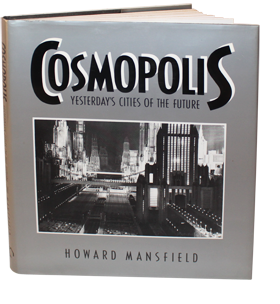 Cosmopolis: Yesterday’s Cities of the Future is a pattern book of expectations. The book is generously illustrated with a gathering of plans from the City Beautiful to the Italian Futurists, La Cite Industrielle, World’s Fair utopias, science fiction visions, and the grand plans of the Moderns. Cosmopolis is the story of the ideal city we never achieved, and the great plans that went into making over precincts of our urban landscape. Now in paperback from Transaction Publishers.